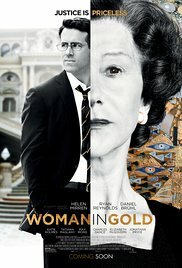 “Woman in Gold” is a wonderful and sometimes touching film. Not because of the topic as this was already highlighted in “The Monuments Men“, but because of the brilliant rendition Helen Mirren is showing here. A role that suits her perfectly. A distinguished elderly lady who’s a descendant of a wealthy Jewish family and who was forced to flee to the United States during Austria’s annexation with germany. She left behind everything: family, personal things and valuable belongings that were owned by the family Altmann. The resentment towards the German ruler obviously is still as lively now as it was in the past. And despite her intention never to set foot on Austrian soil again, she still makes the overseas trip to reclaim the famous painting “Portrait of Adèle Bloch-Bauer” by Gustav Klimt, since she’s the rightful heir. That this invaluable piece of art was worth a fortune, is swept aside by her as irrelevant. In the end the painting has been sold to a renowned New York art gallery for a mere 135 million dollars. I’m sure at that moment it wasn’t irrelevant anymore. The film is actually twofold. Obviously there’s a less successful part and an exciting second part. The first part, and least successful, is about the court case Maria Altmann starts against the Austrian state, who consider the previous mentioned painting as a national treasure. The fact that it was stolen by the Nazis and actually ended up in their hands unlawfully, was a side issue apparently. So the first thing we are presented with, is an old fashioned courtroom drama with Ryan Reynolds as the young lawyer Randol Schönberg, grandson of the famous Austrian composer Arnold Schönberg and also descendant of a family of war refugees. The fascinating and interesting part of the film focuses on the past and present of the widow Altmann. A metered mixture of images of this zestful character these days and the painful memories weighing on her shoulders. These memories are displayed in old-fashioned-looking sepia-colored flashbacks. A sketch full of contrasts of the still traumatized Maria and the conditions in which she lived during the occupation. The humiliations and fear. When she gets back in Vienna after so many years, Mary’s facial expression proves that this past still weighs heavily on her. Helen Mirren is a kind of mixture of P. L. Travers and Queen Elizabeth. A lady behaving according to the etiquette from the upper middle class who keeps certain values and norms still alive. A stiff Victorian granny who suffers from a trauma and is seeking for justice. A kind of Miss Marple, but then still in possession of an elegant well-preserved beauty. Without any effort Mirren surpasses the young Reynold on screen. Despite his immense importance in the complex legal procedure, the character pales in comparison with the engaging, witty and sometimes tragic person performed by Mirren. Despite the fact that now and then she brings forward corny sounding quotes, she remains a credible and worthy character. Of course you can cite that the Austrian people are portrayed in a one-sided and caricatural way and look like an anti-Semitic nation that supports the Nazi-regime. Personally, I’m convinced that it’s pretty close to being true and that it’s more an instinctual survival tactic than that they were supporting that ideology. But that’s another discussion. Maybe the relationship between Maria Altmann and her aunt Adèle could have been worked out a bit deeper. But the acting of Mirren and the tragic images of the past create an unparalleled film filled with tragedy and justice.